This Rainbow Grilled Cheese Sandwich Is All The Rage In Bangkok! 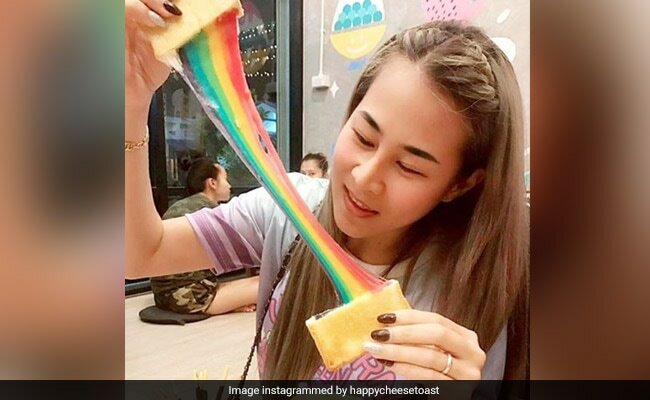 Happy Cheese Toast in Bangkok has mesmerised locals and tourists with their range of beautiful rainbow cheese sandwiches and here's why you must try it! There's something infinitely satisfying about a hot grilled cheese sandwich. When the melted cheese oozes out from in between crispy, grilled pieces of bread, your brain is bound to go on a serotonin overload, just at the mere sight! But it's 2018 and much like most of our favourite foods, the grilled cheese sandwich has also undergone an upgrade. Grilled cheese enthusiasts will be thrilled to behold the rainbow grilled cheese sandwich, which is taking the internet by storm right now. The rainbow grilled cheese sandwich is a rage with tourists and locals in Bangkok, Thailand, where a store called Happy Cheese Toast has mastered the art of making these beautiful cheese toast sandwiches. The rainbow food trend has been around for a few years already, with foods like pizzas, bagels, smoothies and smoothie bowls taking on multiple colours. So what's different about Happy Cheese Toast's rainbow grilled cheese sandwiches? Well for one, their sandwiches have an extremely beautiful colour gradation which includes all the hues from VIBGYOR. The rainbow cheese toast has thousands of takers everytime Happy Cheese Toast makes an appearance ast festivals, night markets and events around Thailand. They claim to have the 'first cheese in Thailand'. However, the rainbow grilled cheese sandwich is now being sold by cafes all around the world, given their popularity on Instagram. But how is the sandwich made? The simple answer would be food colouring. The bright colours that pop out from the melty cheese are achieved by mixing several different types of cheese like mozzarella, gruyére and swiss cheese, etc. which are then separated into seven different tins and then given a different colour. The different coloured cheese are then placed between soft and fluffy bread pieces and grilled with butter. Happy Cheese Toast has another variant of the rainbow cheese toast, where the multi-coloured cheese is stuffed between charcoal bread slices. So how does it taste? Well, we all know that you can hardly ever go wrong with cheese. But people seem all too taken by the pretty colours of the cheese to bother about the taste. The next time you're in Bangkok, you may want to try this unique looking grilled cheese sandwich from Happy Cheese Toast. Put this on your foodie bucket list now!